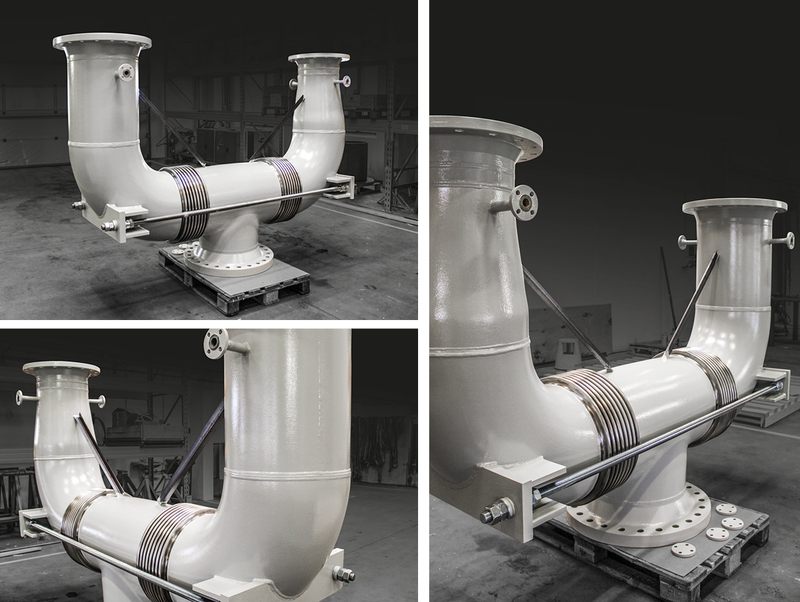 This customized U-shaped pipe assembly with expansion joints was designed and manufactured for a Northern European oil refinery. The U-shaped assembly with expansion joints is specially designed for installing in a pipeline section where two pipes merge into one. As these two pipes have different dimensions, the U-shaped assembly has a smaller diameter (DN 407) on one side compared to the other (DN 508). On the smaller side, a concentric reduction is mounted, this serves to enlarge the pipe dimension in the direction towards the pipe bend. In this way, the diameter on both sides of the U-shaped assembly with expansion joints are the same when the media reaches the pipe bends. Utilizing this design, the same amount of media, from both sides flows through the expansion joints and down to the DN 508 pipe in the bottom of the assembly. The media from the two pipelines then flows into the next section of the pipeline. This type of pipeline layout still needs to absorb movements and for this reason expansion joints are incorporated into the U-shaped assembly. The design ensures that the tie rods on the U-shaped assembly with expansion joints only absorb the lateral and not axial movements. The U-shaped assembly with expansion joints is designed for a full vacuum and a pressure of 4,9 barg. Full vacuum can be the result of the medias velocity. Further, full vacuum can occur if the media in the two sides of the assembly don’t share the same velocity or if a greater amount of medium is delivered from one specific side. This can create a full vacuum in the side where the media is reduced. For that reason, it is important that the U-shaped assembly with expansion joints is designed for such situations. As per the client’s request, the U-shaped assembly with expansion joints is designed with nozzles in both pipe legs. During the installation of the U-shaped assembly with expansion joints the client can then install measuring equipment on these nozzles. In accordance with the client’s request, the U-shaped assembly with expansion joint is coated with a Zinc-rich epoxy primer, with an inner coat of polyamide cured epoxy and a top coat of aliphatic polyurethane. This coating system is long lasting and especially good for harsh environments and long term protection.